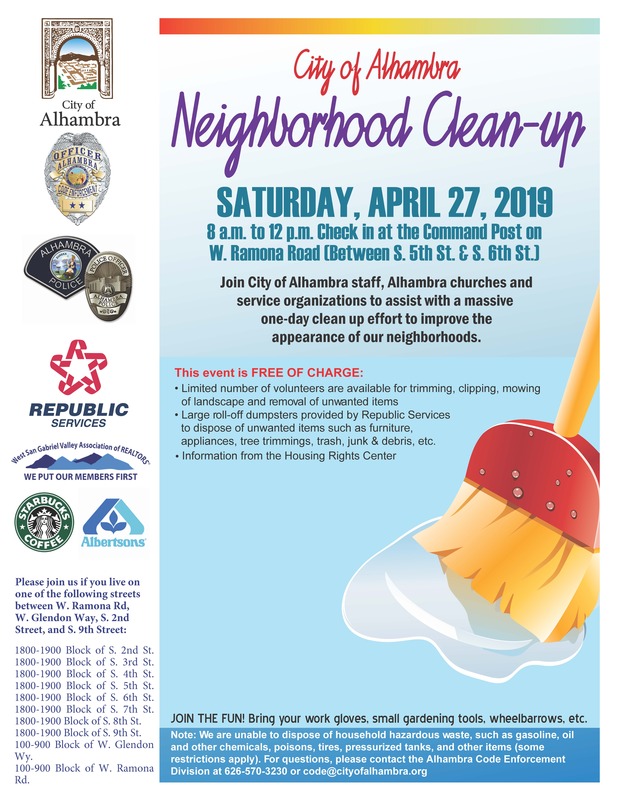 Join City of Alhambra staff and service organizations to assist with a massive one-day clean-up effort to improve the appearance of our neighborhoods on Saturday, April 27, from 8:00 am to 12:00 pm. This year's Clean-up will take place between West Ramona Road, West Glendon Way, South 2nd Street, and South 9th Street. The Command Post will be located on West Ramona Road between South 5th Street and South 6th Street. Volunteers are also needed to help with clean-up efforts! Contact the Alhambra Code Enforcement at 626-570-3230 or code@cityofalhambra.org to volunteer or if you have any additional questions.